At The Harte Used Car Super Center! For smooth handling, refined comfort features and a wealth of advanced technologies at your disposal, finance a used INFINITI Q50 Sedan at the Harte Used Car Super Center. With a bevy of pre-owned INFINITI sedans for sale, including the elegant Q50 Sedan, your used car financing options are endless when you visit our INFINITI dealership in Meriden, CT. 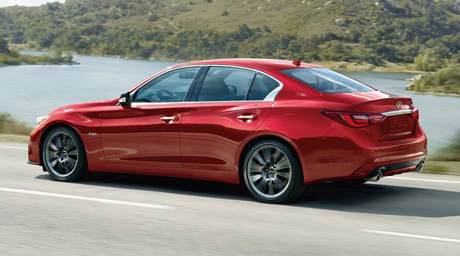 Looking to experience a pre-owned INFINITI Q50 for yourself? Schedule a test-drive today! Whether you’re shopping on a budget or you’re looking for the ultimate value with a used car purchase, our pre-owned vehicle inventory is a great place to turn. The used INFINITI Q50, for sale in Meriden, CT, boasts the authentic performance that you’ll love as you cruise Connecticut highways and byways. Choose from a host of pre-owned Q50 models knowing that top-notch performance doesn’t compromise safety, as our used INFINITI Q50 cars come with comprehensive safety features for true peace of mind as you travel. Wondering how the used INFINITI Q50 interior looks? With comfort perks and technology features in spades, our pre-owned INFINITI sedans provide the benefits of a new INFINITI but at a fraction of the cost. Use your infotainment features to access all your entertainment options, and never worry about getting stuck in Connecticut traffic again knowing you’ll have a cabin that was designed for optimal comfort. Luxury can be purchased for less when you finance a used INFINITI Q50. Searching for a used car dealer near me? With our easy-to-get-to location at 341 S Broad Street in Meriden, CT, the Harte Used Car Super Center loves being the used car dealership Connecticut drivers turn to. Have any questions about our used INFINITI Q50 sedans? Contact the Harte Used Car Super Center and visit us today!